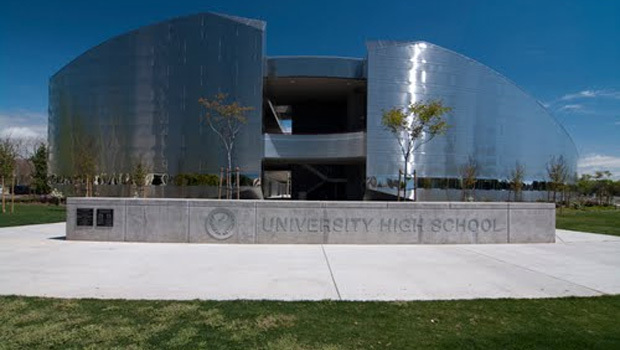 University High School’s long list of accolades grew today with the release of a University of Southern California report naming the school the second best charter high school in the state. The seventh-annual USC School Performance Dashboard, prepared by USC’s Center on Educational Governance, was developed to strengthen accountability among California’s charter schools. This is University High School’s second consecutive appearance on the list. Last year the school tied for seventh. Today’s USC report draws on data from 2005 to 2012 to rate charter schools across multiple measures including financial health, academic performance, state test scores and classroom spending. For the first time, the report also judged high schools on curriculum rigor, graduation rates and college-readiness. “This year’s USC School Performance Dashboard drills further into the multiple dimensions of each California charter school, revealing not only the greater and lesser strengths of each, but also how each is performing relative to other charters and to other California public schools,” said report co-author Guilbert C. Hentschke, professor with the USC Rossier School of Education. The report also points to the growing number of charter schools. In 2012, 81 new charter schools opened in the state. This represents a 17 percent increase and the highest growth rate in the history of California’s charter school movement. “This tells me that more and more families are recognizing that charter schools provide a viable option for an excellent education,” Bushman said. University High, a free public school, was chartered in 2000 and is an independent charter school in the Fresno Unified School District. A 470-student, college preparatory, music- and arts-enriched school, it serves youth in grades 9-12. The school moved into a new, permanent facility on the Fresno State campus in 2010. University High students have access to Fresno State facilities, attend college courses for credit and receive a small-school, accelerated-achievement high school experience. For more information, contact Bushman at 559.278.8263.